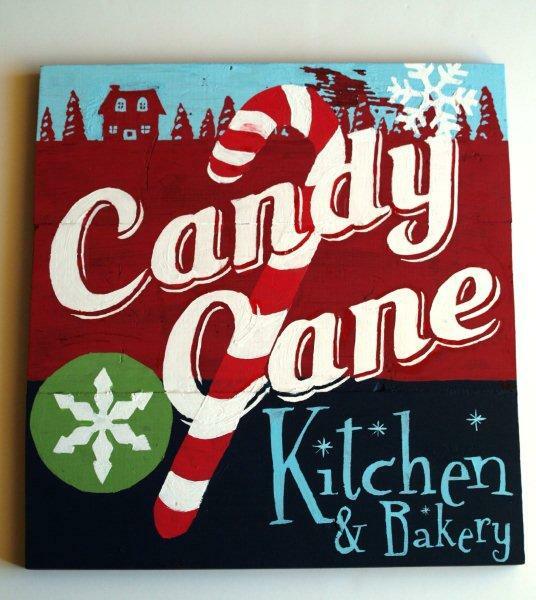 This is a re-post of my Candy Cane Christmas Sign that I posted over at Tatertots and Jello recently. I’ve added in a couple of pictures and instructions for more details – I tend to over-detail tutorials sometimes and I didn’t want to blast the readers over there with pictures. But I thought I’d add them back in for you (because you’re used to me doing that :)! 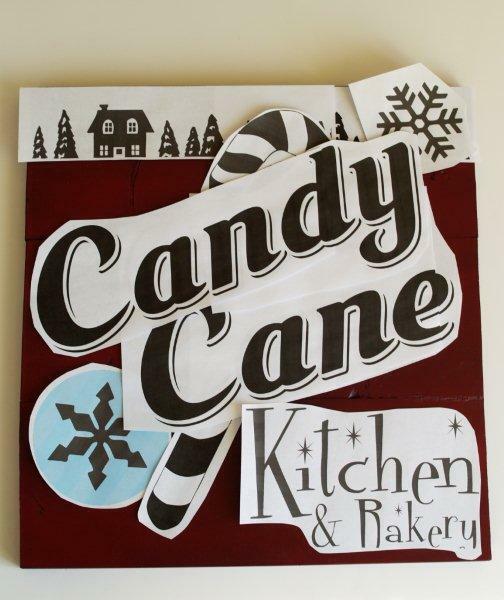 I have a fun Christmas Sign tutorial for you – my Candy Cane Kitchen Sign! Isn’t it fun and vintage-y? I got the inspiration for this sign from this super cute plate I found at Pier 1. I just fell in love with the design but I decided I needed it on a bigger, grander scale. I started off by recreating the design on my computer. Then I took each segment and made a separate paper pattern for each. You can skip that and use the Design Patterns I created if you want. 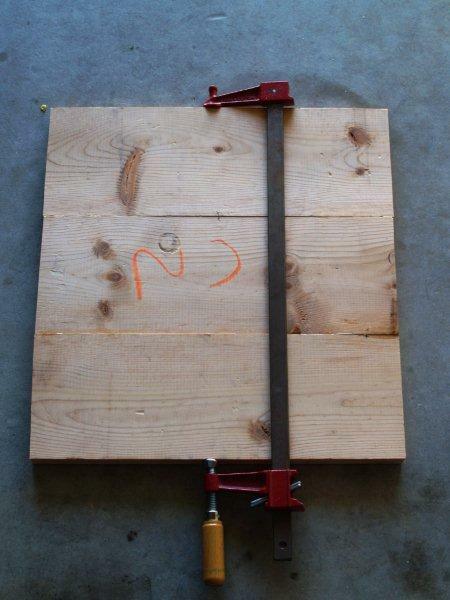 Cut your wood into three 16″ pieces. 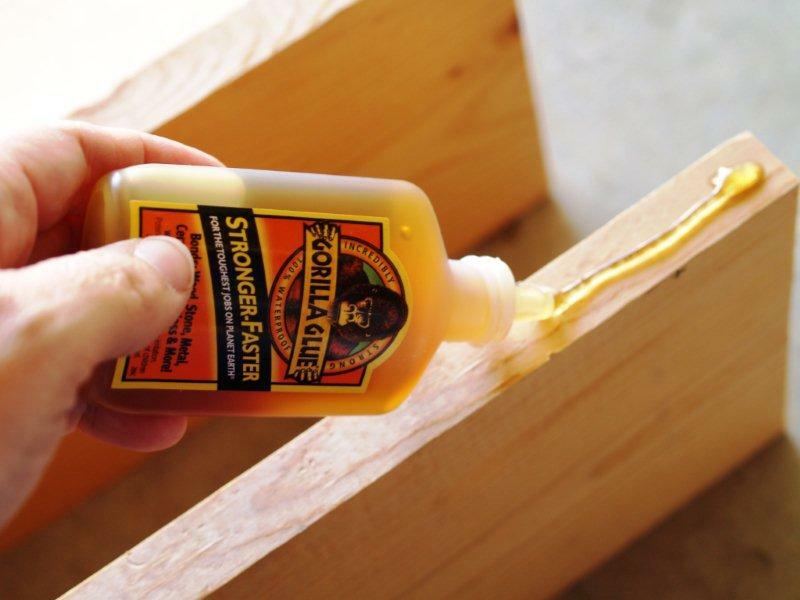 Glue the three sections of wood together, along the long sides, so you make one large square. Clamp the wood together while it dries. You can skip this next step if you want, it’s your call. 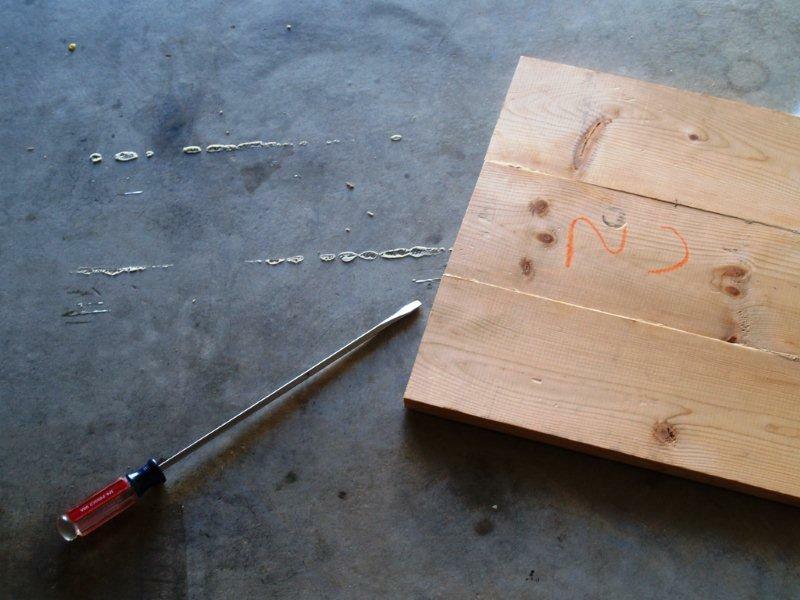 Go out to the garage and check your wood – and realize you’ve glued it to the concrete. Say some fake swear words and pry it up with the hugest screwdriver you can find. Nice. Consider setting your boards on something else, or upright, while they glue. Gorilla Glue expands as it dries. If you are more careful than I was, you can wipe the glue off as it expands and you won’t have this issue at all. 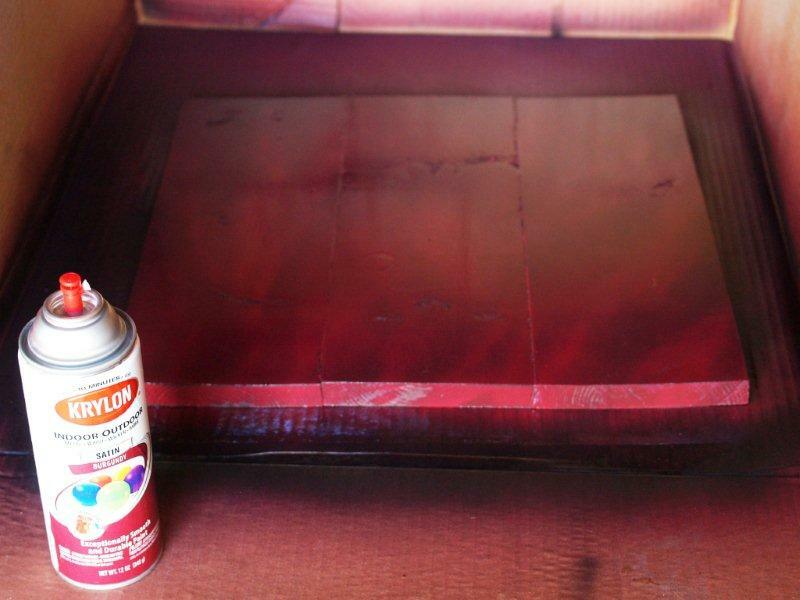 Once your boards are glued together, spray paint the front with your base color. I used a Krylon Burgundy but it wasn’t quite dark enough, so I did three coats, one Burgundy, one Black, and the last Burgundy. That gave me the nice dark red color I was looking for, with the added benefit of another layer of color that will show when it is distressed. I believe you could do several of these next steps with a Silhouette or other cutting machine. I do not have a magical machine so we’ll be doing this old school. Cut out all your pattern pieces. You will need to tape several of the large pieces together since they are too big to print out on one sheet of paper. 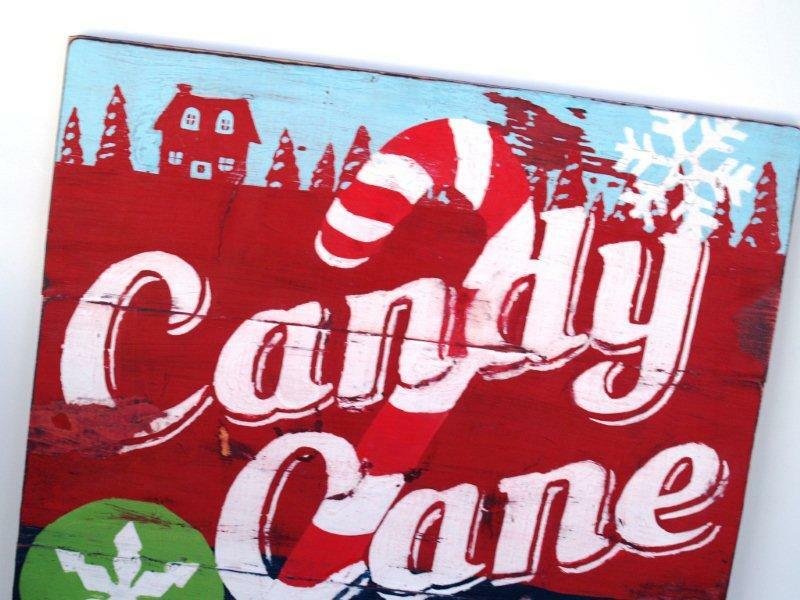 On the “Cane” Pages, I’ve left the outline of the word “Candy” so you will know how close together to place the words. Layout everything on the boards to check your placement. Trace the designs onto Freezer Paper. Leave enough room around the designs so that when you paint, there is plenty of Freezer paper around the stencil. Paint your base colors on the sign with your craft paint. 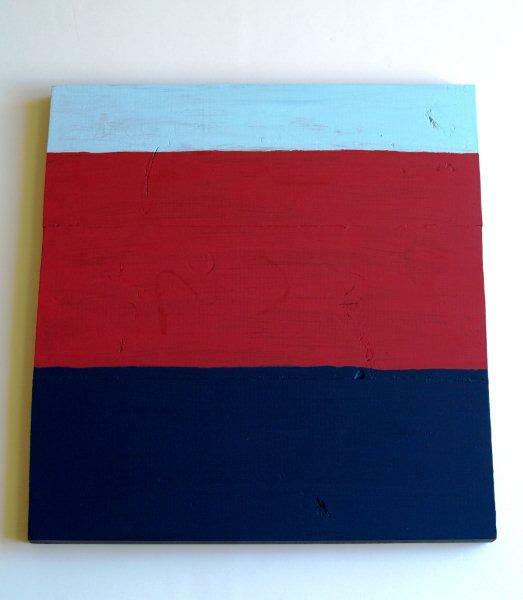 The craft paint colors I used (all from Walmart) were Folk Art Calypso Sky (light turquoise), Cardinal Red (dark red) and Navy Blue (dark blue). Cut out your stencils. I used an exacto knife on a self-healing cutting mat. You don’t need to worry about the little snow marks or the windows. You can add those details back in by hand later. 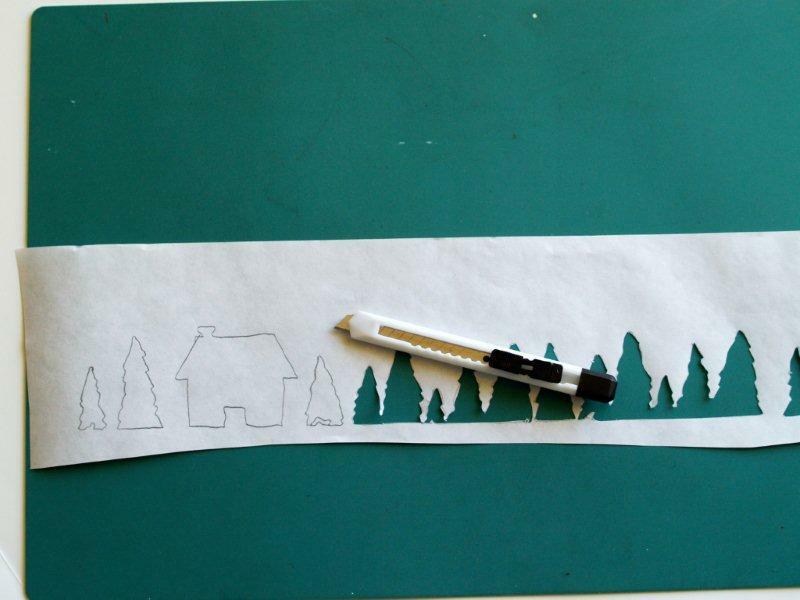 Lay the tree stencil at the top of the board so that the bottoms of the trees just barely overlap into the red section. Lightly iron on the stencil. Here are some tips for ironing onto wood. • You don’t want the iron super hot. It will cause the paint to bubble excessively. We want a little of this, because it will help with distressing, but not too much. • Be careful to keep the iron on the freezer paper. Use the tip and sides if you need to. Paint WILL come off the wood and onto your iron if you iron on the painted section. If this happens use a balled up damp paper towel and wipe it off while the iron is hot. 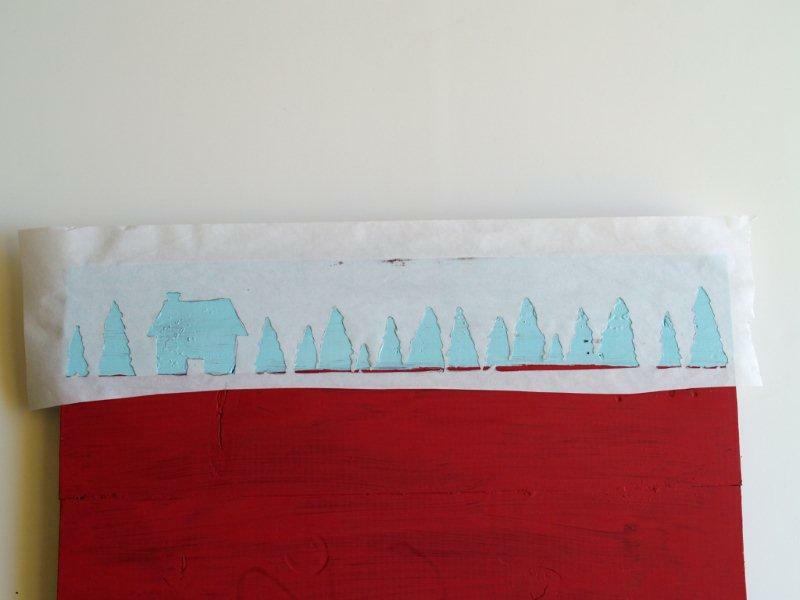 Once the stencil is in place, paint the trees and house red (Cardinal Red). 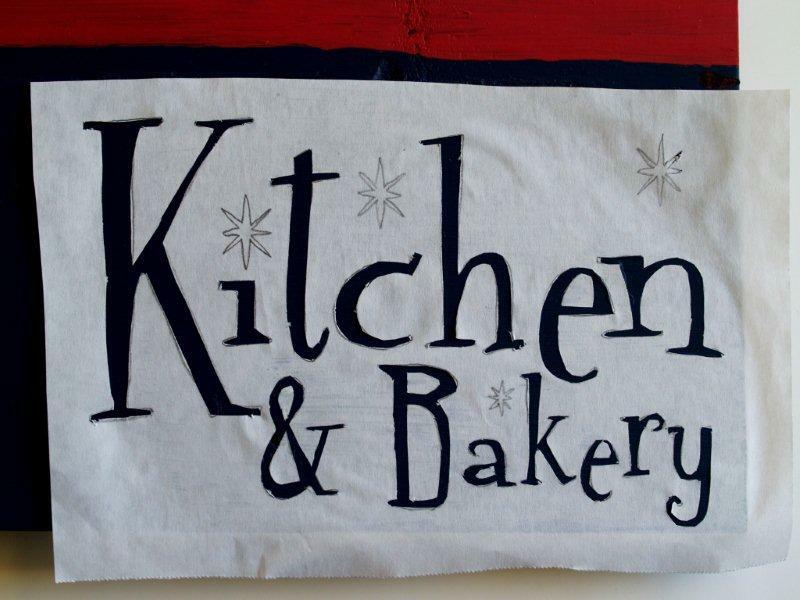 While that is drying you can do the same thing with the Kitchen and Bakery stencil. I did the little stars by hand, and I used the same light turquoise paint (Calypso Sky) that was at the top. For the letters that had pieces inside (B, E, and A) I cut those little pieces out separately and then placed them in position before I ironed it on. After you paint in the designs, lift the stencil. You could have some base paint come off, because of the ironing. This is fine. Saves work later. There is a chance that the paint will leak under the stencil just a bit. Once the paint dries, just go over the edges a bit with the color below and paint over those little sections with a tiny brush. This will clean everything up. In this picture you can see the stars, the snow on the trees, and the windows of the house. You can also see where some paint came up with my stencil. Cool huh? Next steps are the large green circle, the candy cane, and the snowflake on the top right. 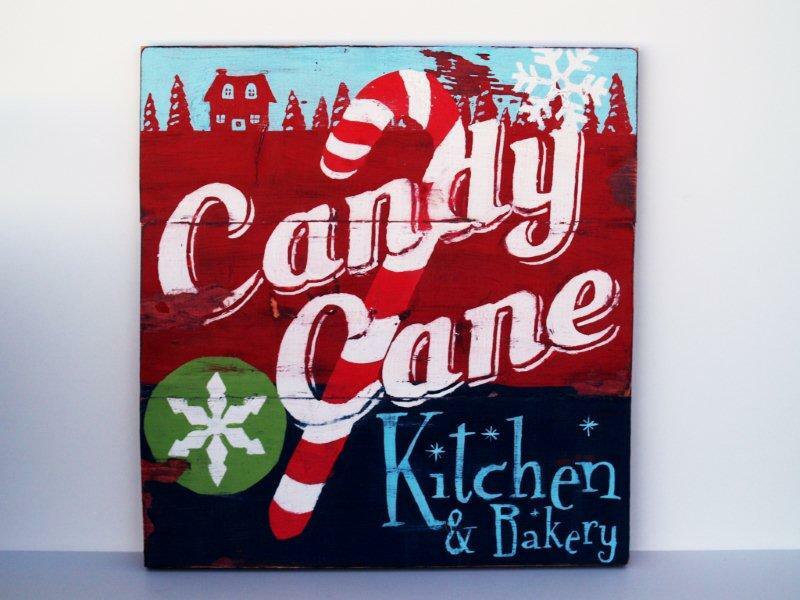 For the candy cane, I stenciled in a lighter red(FolkArt Apple Red) than the base red, and then painted the white(FolkArt Wicker White) stripes by hand. You could make two stencils if you don’t want to free hand it, and then stencil the white once the red has dried. 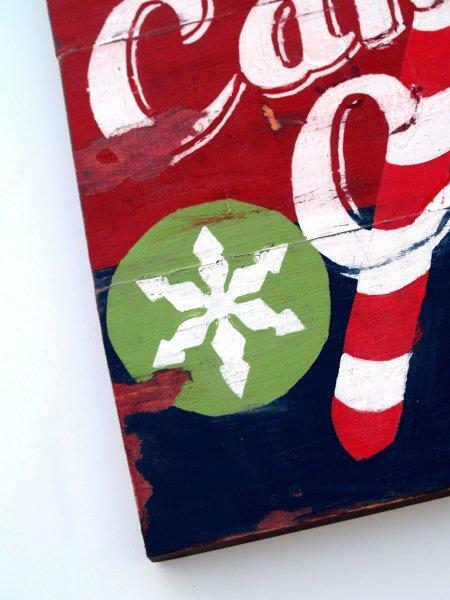 Once the green(FolkArt Fresh Foliage) circle has dried, stencil on the other snowflake. 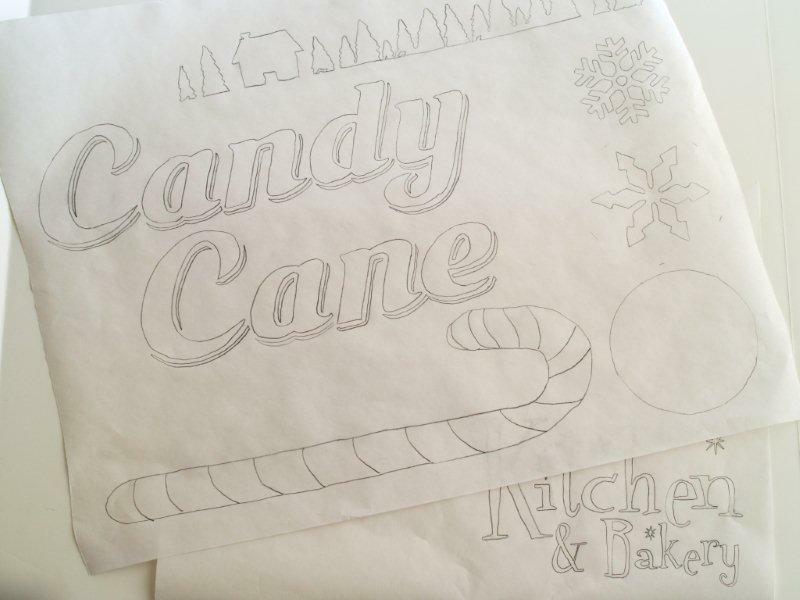 Last stencil – the Candy Cane lettering! For the distressing, I sanded all four edges. I used smallish pieces of freezer paper at different parts on the sides and ironed them on, then pulled the paint off. Then I sanded some of the lettering and shadows. 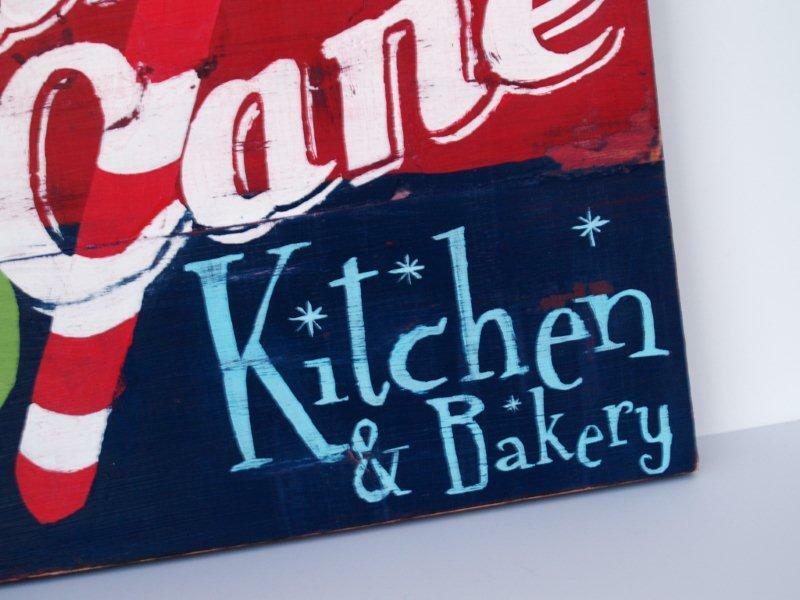 If you look closely you can see that I sanded a shadow around the Capital C in “Cane”. You can also do extra sanding on the places the boards are seamed together and any knots or irregularities in the wood. I finished with a light sanding in both directions over the whole sign. Don’t go all in one direction with your overall sanding. It wouldn’t distress that way normally and will look more realistic if you sand in several directions. Here are some close ups of the distressing. Add in some hanging hardware if you are going to hang your sign. And we’re all done!! So much more fun than a little plate right? I hope you enjoyed the tutorial!! « BFGD 18 – Last Giveaway!! How cute is that?! Super cute! Love this! This is going on my “to do” list! Thanks so much for sharing! I am loving this and you really made this look so easy! 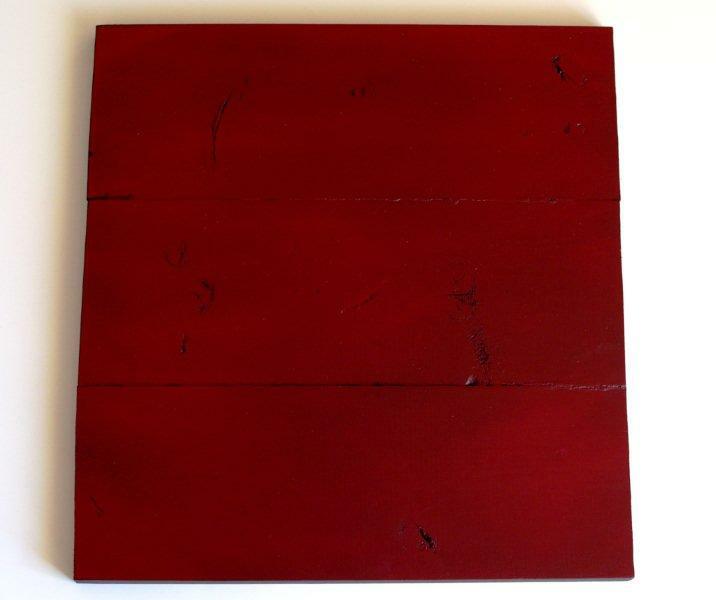 I have seen some art work that I loved like this but it was out of my price range. I just may have to attempt this! Thanks for the tutorial! this is WAY cool, great job :) I like… a lot! I think this is SO fabulous! I love this time of retro artwork. this is so adorable! Thanks for the tutorial. I never would have know how to create something like this. I am pretty much clueless when it comes to painting. This is great! I think I just may have to do this one. beverly this looks like something you’d pay big bucks for… absolutely love it! Super cute sign. Thanks so much for sharing the tutorial and design. This is fabulous!! I totally need one for my kitchen. Unfortunately, time is at a minimum right now and I think it would be Valentine’s Day before it was completed. I’ll put it on my list for next year though! Great tutorial! All the things I love in one project…. wood, paint, and freezer paper!!! Thanks. Awesome tutorial! I LOVE the detailed pictures! That is AWESOME! I recently bought a Silhouette. Would you use vinyl instead of freezer paper? I would love to try this! You have a lot of patience to hand cut all those little details. You ROCK! OMG. Spray paint!!!!?!!? I’ve slaved with multilayers of paint! I’m almost done with this tutorial! I dont think I will ever look at stenciling the same way! 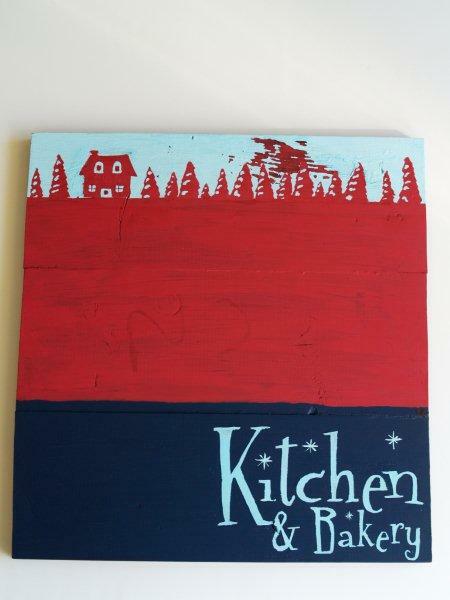 Thank you for such an amazing piece that I cant wait to hang in my kitchen! Love the sign and the plate! Great job on it. Wow Bev, I really love the retro feel of that sign. Beautifully done! Gotta get me some of that freezer paper! I LoVE this!! You are so awesome. I have a silhouette and would love this in JPEG form. could you email it to me kimdimrich@yahoo.com. I love your projects and have made a few necklaces from your tutoritals. You are amazing!!!!!! You are very crafty and very patient! Looks super! Oh my Gosh. Are you kidding me? You amaze me. Thanks for the great tutorial. That’s a whole lot of work but great results. I really like it! Oh. My. GOODNESS! This is amazing, so stinking cute! As always your knock offs are better than the originals! 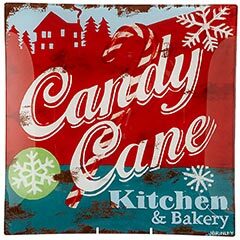 Wow..the candy cane kitchen sign you made is COOL. I am quite impressed. Love this! Just became a follower. I’m glad I found you!! AMAZING! This is just so perfect!! Im in love with it! I am going to have to make one! This is amazing! I’m bookmarking it for future inspiration! I have to tell you that I went in search of freezer paper after seeing this project! I haven’t used it yet…it will happen soon! I love this sign! PS I’m a new follower! I love the feel of this sign. I think I want to make one! So many projects so little time! I love freezer paper – what an amazing tool. Beautiful job and so much fun. We are having a Krylon party at the DIY Club too! Starts tomorrow (I think). That is awesome! I really love it, it looks so great. I am smitten! Your sign rocks – great tutorial. I love your sign! I don’t think that your tutorial is over-detailed! It helps so that we can follow your instructions step-by-step – thank you! I LOVE LOVE LOVE this! Thanks for sharing a tutorial. I will be making a similar one this weekend!! TOTAL CUTENESS! I NEED ONE:) You make it look so easy. I just might have to try it out! THANK YOU! Love it!!!! Thanks for sharing your templates. I made your sign and I.LOVE.IT! Thank you so much for the tutorial – it was really well written and easy to follow : ) Thanks again and Merry Christmas! I totally love, love, love this sign! It is bold and colorful! I am featuring it on Spunky Junky today! So creative, I love it!! So I am SUPER behind with blog reading, but I just discovered this latest project showing off how truly talented you are. I keep looking at this sign and saying–she MADE this?! You amaze me, my friend! Yeah, I can’t do that, but I LOVE that you can and that you share it with us. LOVES! Seriously creative! Beautifully done. Thanks for the tutorial. I spotted this at Funky Junk and it caught my eye right away! It is adorable!! Love, love, love it!! Oh my goodness. LOVE THIS!!! I would love to make one..Question. You said you recreated this on your computer. Did you scan the plate into the computer or did you make it in a program? I love the colors, Red, Turquoise and Lime Green, my favs!! Thanks for taking the time to share this with us. New follower and would love it if you would visit my new lil blog and follow back if you like. YUMMY! So cute; thanks for the tut!! I think the numbers on the wood are typed incorrectly – I wanted to make the sign, but the measurements don’t seem right. Or I just don’t get it. Can you help me out? Beverly, This are ADORABLE! You did such a great job! And your instructions are fabulous. So easy to understand and follow. Thanks for showing us the how to! This has a classic vintage feel that I just adore. I like how you took all the extra steps! Nice work! Thanks for the great link up! I’ll be featuring this on BCD tomorrow! That is beyond amazing! I am almost positive that mine wouldn’t come out as cute, but I would so be willing to pay someone that is more talented to make one for me. It is cuter than the plate!! WHAT? This is great. There is NO WAY mine would ever turn out. I will, however, be making a stop in a Pier 1 this week after seeing that plate. Love the design!! 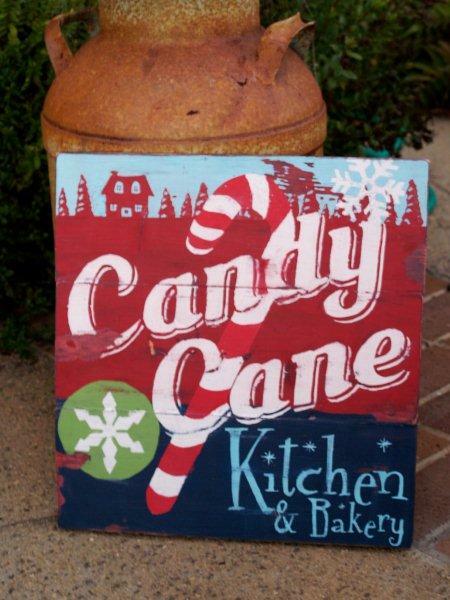 Love the sign.The colors are adorable.Thank you for sharing! Absolutely gorgeous! I’m going to follow along to see what else you have up your sleeve! Im your newest follower! I love this sign. Stop by http://mostlyfoodandcrafts.blogspot.com/. I’m so glad I’m not the only one!! I gorilla glued some boards together like this and glued them to my concrete also! It was awful! I felt so silly! (Wow that was also of exclamation points). I LOVE this! It is so cute and you make it look so easy. Thanks for the fantastic tutorial! Darling! I would love the jpg images if possible. Please send to my email. Thanks! like everyone else in the world I am loving this! You do amazing work, as usual. I’ll be featuring this tonight on Topsy Turvy Tuesday’s! Thanks for linking up! It’s amazing and thankyou so much for the tutorial and print outs. I am attempting to make this and am struggling with the xacto knife! But I think it will be cute. I will try and send pics when I’m done. It may take awhile. I made two of these, one for me and one to give as a gift! I love the colors and your tutorial was awesome! Thanks so much! I love vintagey signs as well. you did a fabulous job with this. Thank you so much for sharing how you did it with your wonderful tutorial. Wow, love this. Great directions! Just wanted to let you know that I featured this today on FTF! Grab a featured button if you would like one and don’t already have one! Thanks and Merry Christmas!! It is so pretty and perfectly vintage! I love it! Great tutorial too! Just wanted to thank you for this amazing tutorial. My sister saw the plate this was inspired by, and loved it! I made this for her for Christmas, and it turned out so great. She loved it! I’ll share pictures soon! You are the best! I love this tutorial. Painting usually is a bit too daunting for me, but now I think I want to give it another try. Thank you! What a great idea and excellent tutorial. Thanks for sharing. just came across this on Pinterest, love it! Thanks for sharing the tutorial. 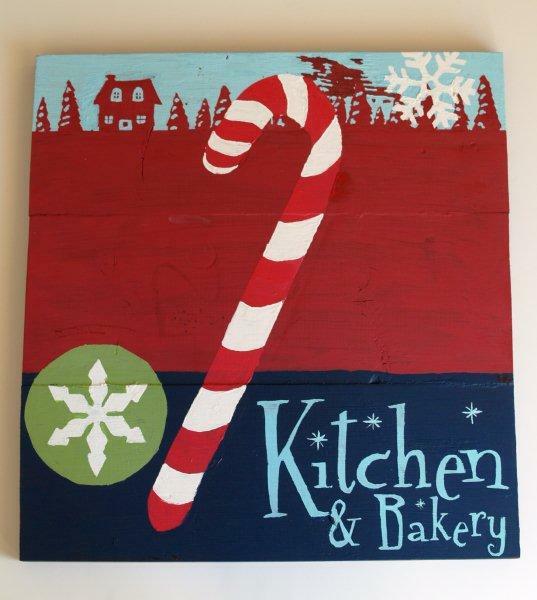 I LOVE this – have been wanting to make it for the last 2 Christmases, and this year I’m gonna!!! I see that you have it available for the silhouette, can you email it to me? Or, if i overlooked it, let me know where to find it? TYSM!! 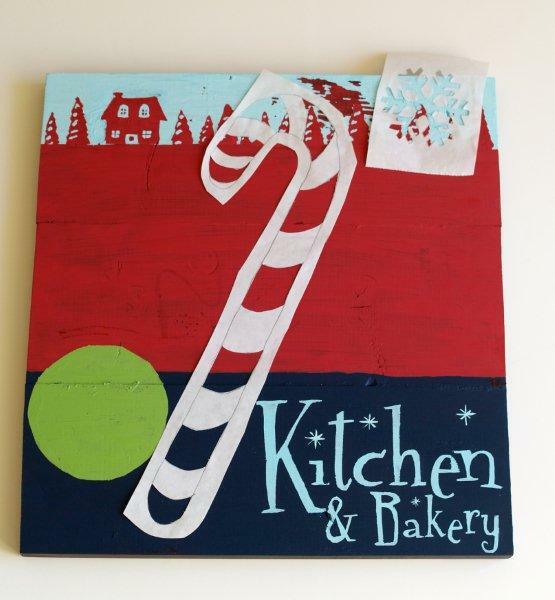 What a cute Christmas sign for the kitchen! I’m definitely making this so THANKS for all the pics… yep I’m craftily challenged and need all the help I can get!